The calendar is a very intimate part of human life. It not only keeps track of the date but also it helps to keep track of progress. 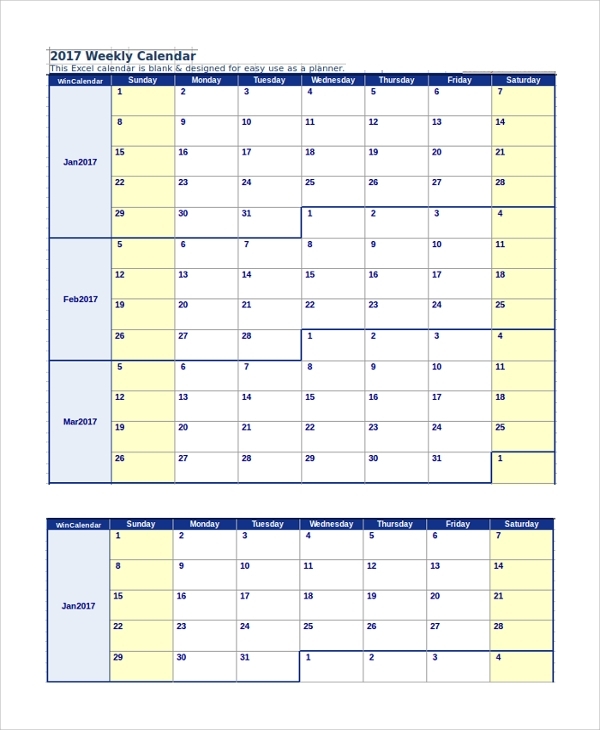 There are different types of calendars available below which are targeted to specific audiences such as an academic calendar for students, appointment calendars for corporates and split calendar, weekly and monthly calendar to measure personal progress. All of them are 2017 Printable Calendars. 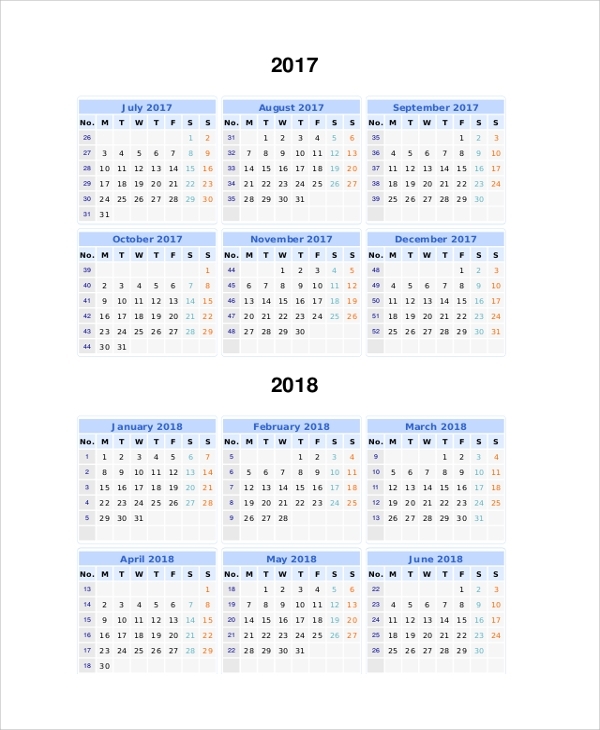 This is a split year Printable Calendar for the year 2017 and 2018. It starts with July 2017 and ends in June 2018. It is more relevant now as half of the year is gone. It will help to enter the new year without buying a new calendar, and it has a great colorful design. 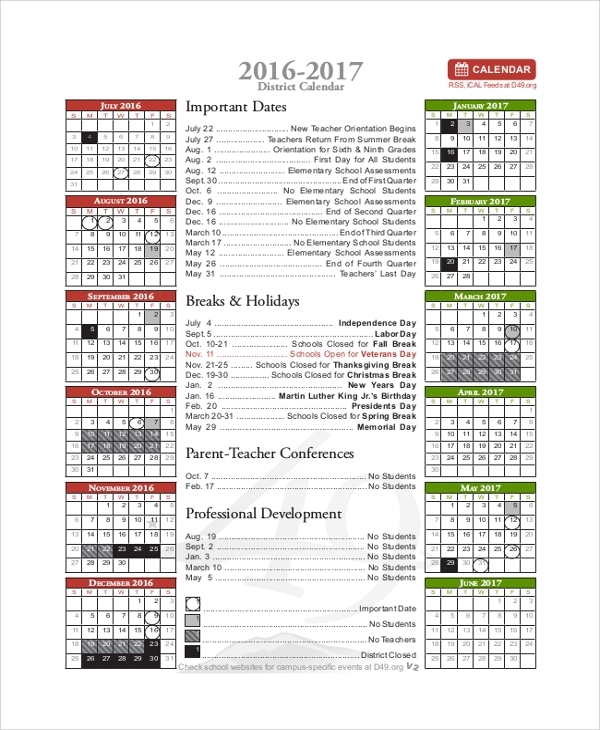 This is an Academic School Calendar for 2016-2017 containing August 2016 to June 2017. It contains multiple colorful dates signifying the active dates, holidays, exam dates and other significant days. 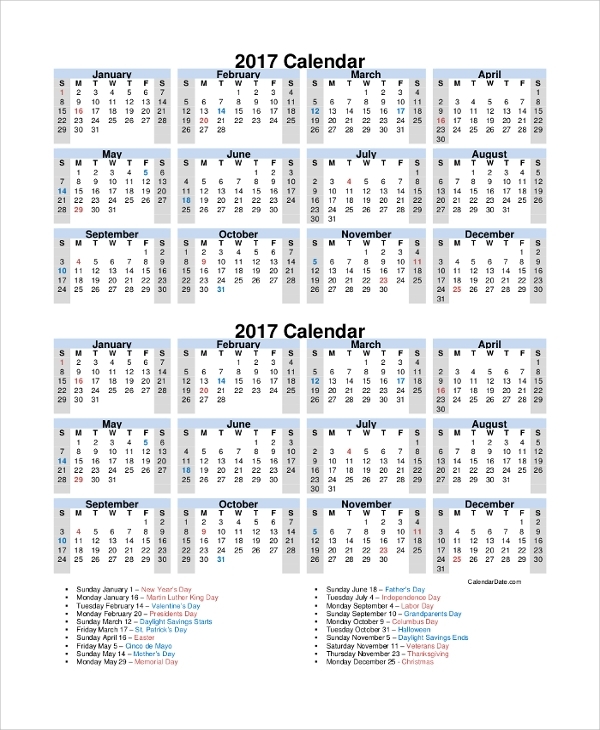 This is a one-page 2017 yearly calendar which is printable, and it contains the list of all the important holidays. It can be pasted in a place, and it will attract attention all the time due to its colorful design. 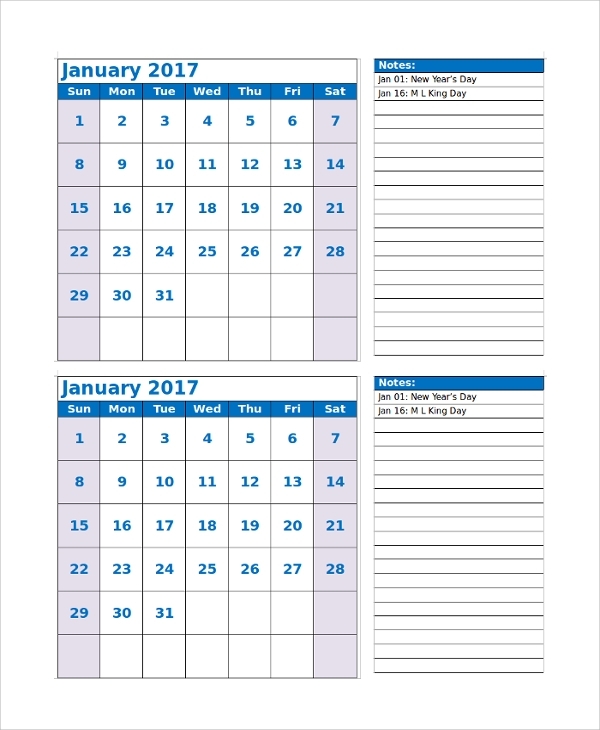 2017 printable calendars have fantastic design and hence, they are visually attractive. They can be used to write down the appointments, make weekly and monthly to-do list, keep track of personal and professional performance and growth by rating every day. 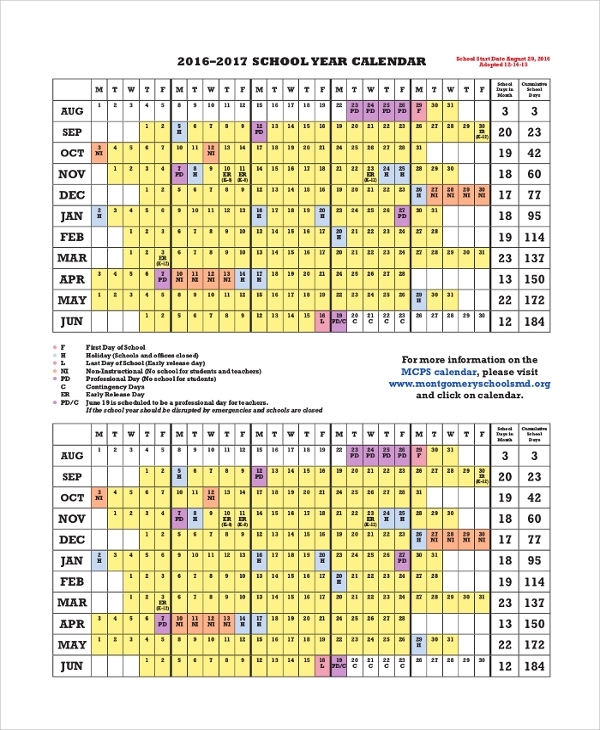 There are Academic Calendars with different colored boxes to understand the active days, holidays, other important days for the students. There are general calendars with important holidays marked on them which can be printed and pasted for general purpose. This is a well-designed Printable Monthly Calendar for the year 2017. Every page contains one month, and it comes with space for writing notes. It is best for writing down appointments, a to-do list of a month and for corporate uses. This is a well-organized and beautifully designed Printable Weekly Calendar template in excel. It is printable and can be used to mark dates or write down notes below the dates as space is provided for that. Keeping track of progress on weekly basis is useful. 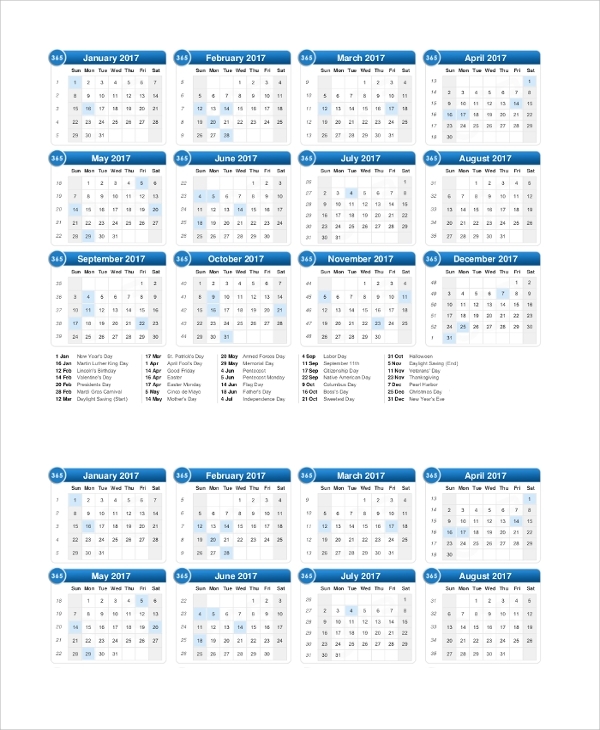 The targeted audiences for 2017 Free Printable Calendars are the students who need to have a useful academic calendar that has the active and holidays marked, and other significant dates can be easily found. They are useful for corporates to mark important dates to meet the deadlines. Any professional will need them to mark the appointment dates or important professional dates. 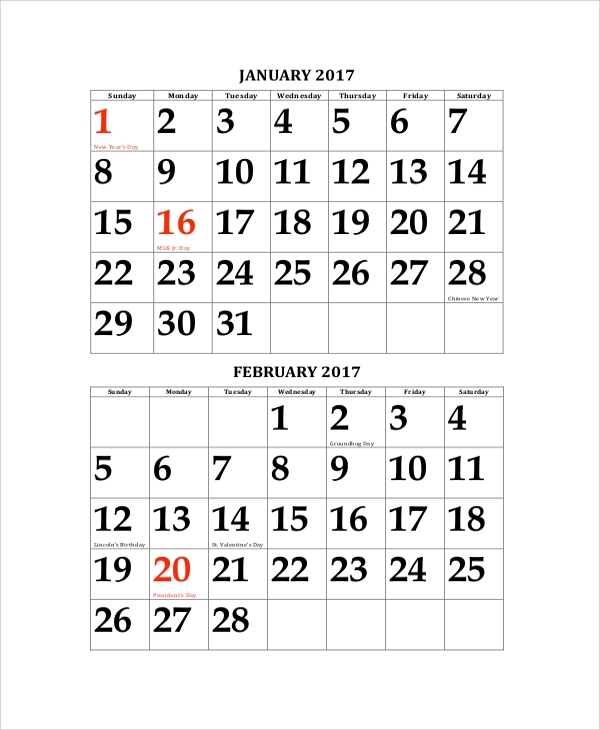 There are split and general calendars for general purposes. The above-mentioned 2017 Printable Calendars have an excellent and eye-catching design which is why they will always attract your attention and keep you reminded of the task and the progress. It is very useful for companies to make employees aware of the deadlines for the milestones. There are split calendars to avoid the inconvenience one feels in a new year; there are academic calendars for students and much more.